How Can I Create A Licence In The BigMIND Partner Program? /Partners 2.0 (BigMIND) /Partners 2.0 (BigMIND) / Partners How To / How Can I Create A Licence In The BigMIND Partner Program? Sign into the Reseller/Partner system. On the left-hand pane, click on Licences Management. Click on the Add Licence button. Click on the Home Licence option → Click the Next button. The available plans will be shown for you. Take a look at the specifications of each plan, and click the Select button for the wanted one → Specify the Number of Licences you want to generate → Click the Next button. The final step is to review the summary of the plan. Just click the Create Licence button. Click on the Business Licence option → Click the Next button. 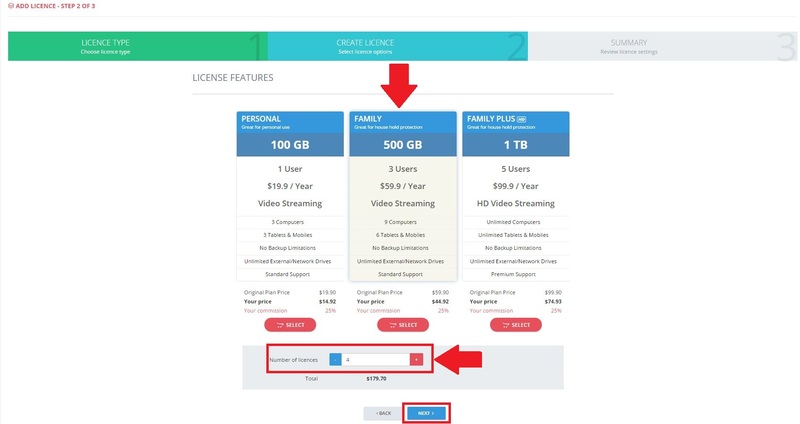 Choose the features and storage amount you want this licence to give to the user → Specify the Number of Licences you want to generate → Click the Next button. Important! The funds will be deducted from your account once the licence(s) is(are) created.